Interview: Catfish And The Bottlemen on touring, success, and 'The Ride'. Only two albums into what’s likely to be a long-lasting musical career, Catfish And The Bottlemen have achieved a number of very impressive feats - a Platinum debut album, a #1 sophomore album, sold-out shows in venues that many bands dream of one day playing, and even opening for Green Day later this year in America. ...being a fan of a band, there’s no better night out that you can pay your money for - you go watch something, your favourite band with your best mates, hear your favourite tunes off your favourite album, and see your heroes. COUP DE MAIN: I believe a congratulations is in order, as Catfish And The Bottlemen have reached their ten year anniversary as a band this year! Do you have any special plans to celebrate? VAN MCCANN: Just playing sold-out shows really. After those, getting swigged. All the gigs we’ve been doing are gigs we dreamt about doing when we first started, when we started playing together and stuff like that. These are just kind of moments, big nights out, every gig we’re playing. Especially here, Sydney and Melbourne, the last two headline shows here are massive. It’s been a good year in general. BENJI BLAKEWAY: It just happened to coincide with the tenth year. CDM: Maybe to celebrate, you should finally come to New Zealand and do your first ever show! The Kooks came to NZ in 2015 without you guys and we’ve been waiting for you to come visit ever since. VAN: Oh yeah, they went - they left us here. We’d love to, we’ll go everywhere. BENJI: Actually, I asked Steve yesterday if we were ever going to go. So I guess it’s on my mind. CDM: All of ‘The Ride’, and particularly ‘7’, chronicles the difficulties of being a touring musician thoroughly - the line, “And I'd beg you, but you know I'm never home,” is really powerful. How do you try to manage that balance of maintaining relationships (be it platonic or romantic) while touring and being a full-time musician? VAN: Just in general, seeing family and stuff? JOHNNY BOND - BONDY: I guess you savour the little bit of time you do get with people. If you’re at home constantly, you’re going to be seeing people and doing very normal things, but when you’ve been away touring, you make a thing of when you get back - you spend quality time with people. BOB HALL: You save that all up - makes you appreciate it a bit more. VAN: They come to shows a lot too. We just played at Liverpool Arena, and we had a lot of family there. BONDY: You do end up doing more remarkable stuff with them. It means more. Later in the year we’re touring with Green Day, and the last show is at the Rose Bowl which is enormous - I’m bringing some family out to come to that show. Couldn’t really do that in any other lifestyle. CDM: In the chorus of ‘7’, Van you sing, “I don't think through things, I never get time” - is this a sentiment that you still relate to, even a year on from its release? VAN: I guess, in a sense, it’s what you said before, about how it’s ten years that we’re celebrating. We just breezed through that, we were just like, ‘Oh, it’s ten years.’ We probably had a drink, or whatever we did for it. But you never have time to stop and look at it, stop and think, and see what’s going on. I guess, yeah, we’ve still not come to that point where we’ve stopped, and went, ‘Look at what we’ve done,’ because it keeps moving. I guess that’s what that’s at, you don’t get time to think, ‘cuz you’re always busy. CDM: I guess you look back retrospectively, at what you’ve done. VAN: Yeah. I guess it still does. It ['7'] resonates on stage when we’re playing it, when the crowd is going nuts. That’s one of the ones - and it has been since we first started playing it - that goes off the most. I love that one. CDM: The sentiment in ‘Anything’ is really romantic - “I won't smoke if you don't no more / 'Cause I know you hate the taste of it.” Do you think that relationships need compromise from both parties, in order for them to work properly? VAN: <laughs> I guess, yeah. It has to be a two-way thing, doesn’t it? BOB: You can’t be selfish, can you? CDM: What’s your favourite song, lyrically, that you’ve written? VAN: One of the new ones. On the next album. CDM: Bondy, you’ve talked previously about not wanting to record "something that isn't achievable live." Is it important to you as a band for your recordings to be able to be replicated in a live setting? BONDY: I think it’s more that there is somewhere to take it live. It’s an album that’s easily replicated live, there’s not a huge amount that won’t be played when it actually comes to hearing it at a show. VAN: It seems like people when they see it live, they say to us that it sounds 'monster'. It just breathes a bit more. I like when we play these outdoor shows - like we played Splendour In The Grass yesterday - and you hear what the songs were written for, those big outdoor capacities. So I guess it does expand live, doesn’t it? CDM: Your live shows seem really important to you as a band - you’ve said many a time that you write with the live setting in mind. Do you have a favourite live moment in your set currently? VAN: There’s always a good moment. Bondy’s got a big solo in ‘Soundcheck’. When that drops, the earth moves. BONDY: Festivals watching the intro to ‘Pacifier’, I think that song is just the perfect tempo for the whole crowd to move like a sea of people moving up and down. VAN: When we play ‘Outside’, the last one on the second album, that’s good to play live - the crowd have gone nuts for that one. CDM: Van, what’s your favourite middle eight you’ve ever written? VAN: I like the earlier stuff. I love the one in ‘Cocoon’, I think that one’s really good. Because everyone’s hid a ciggy from a relative, haven’t they? Hide smoking from relatives. I really like that one. I’m really good at middle eights though, all of them. The McCann middle eights, that’s what they call them. I’m known for them. CDM: You said that Ben Lovett (of Mumford & Sons) taught you how you write a middle eight. How did he teach you? VAN: I didn’t know what they were! He just opened my mind up. Our songs always used to be about two minutes long, like ‘Kathleen’ is 2 minutes and 41 seconds - they all used to be like that. So he taught me how to take a song, and open a song up a bit. I never liked long songs, so I guess he just opened my mind to that. Lovett did a lot for us - he signed us, he took me to New York for the first time, he took us all out there for the first time. He’s a good bloke, a very good bloke. CDM: When talking about bands, Van, you’ve said: “People like investing in a band properly." What’s it like, to see that investment from your fans in real life, with them buying your albums/tickets/merch? Do you find it important to return this investment? VAN: Yeah, definitely. We talk about this a lot, if you’re a fan of a band, I think the worst thing in the world is when they disappear for ages and you’ve got to wait for an album. But when they come back, you love it. But I think if people are putting you in this position, people putting 5,000 in here [Sydney’s Hordern Pavilion], selling this place out, four-and-a-bit thousand in Melbourne, yesterday at Splendour, how many were there? 35,000. That’s what we’re doing in London - that’s what we just did in London. It’s happening internationally now with that second album coming out, so around the globe it’s getting to that level. So I think the worst thing that you could do is disappear, go to the desert, grow beards, re-discover yourself - do you know what I mean? We’re still hungry for it, and we’re still fans of music. We still sit and pass bands around with each other, and play music all day to each other. So we love writing, and making albums isn’t a chore, it doesn’t take us two, three years to make an album, it takes us two weeks, two months at the most. And the next album is all good to go. We always have them in the bag well in advance. I think it’s important that you always keep going back, [if fans] sell these places out at whatever o’clock in the morning for you, then the least you can do is deliver a couple of songs. CDM: Has the creative process always been fast for you? VAN: Yeah. I talk a lot, so I’ve got a lot of words to say. CDM: Do you ever get writer’s block? VAN: No. Ciggy break, we call that. CDM: You’ve said that you don’t write songs to get in the charts, you write songs to sell tickets. Do you think that the charts and radio have the same importance in the music industry as they once did? BONDY: I think radio does, especially over here. ‘Cuz over here it feels like the way it works back home, except with a much larger country. In England, we’ve got BBC 1, 2, up to 6, if you get on Radio 1 over there you’re being heard by the whole country - which is what it seems like here with Triple J, which is pretty unique. In the States, there’s different alternative stations. I think Triple J has helped us get to sell these rooms out, I don’t think it would have been possible without them. The power of radio, definitely. VAN: The Top 100 thing that they do every year, that’s massive, and they put three of ours in that. BONDY: I love how much of a thing that seems here. It seems like everybody just sits and has a drink or a BBQ and listens to the whole thing. It’s an event. VAN: It’s like pirate radio style, in a way, where everyone is just glued to it for an hour. CDM: What’s the official status on Catfish And The Bottlemen album #3? VAN: What do you mean? It’s class, brilliant. VAN: Because we’ve got this whole tour-- so we’ve got Australia, straight to Japan, six weeks in the U.S., and then on the last show we finish at the Rose Bowl, probably have a few drinks, then the next morning go straight into it. So I don’t know, whenever. As soon as the management and label give us the money so we can afford to record it, and then we’ll go. CDM: It’s interesting that you guys plan everything so far into the future - and that you’ve gone to your label/management wanting to release music, and they’re telling you to slow down! Normally it’s the other way around, with label/management wanting to get new music out and chasing the artist. VAN: We chase them. We bring them back off their Christmas holidays, and we say, ‘What are you guys doing on the beach over there? Get us a recording boost.’ We’re good to go. We love touring. You know what you said before about the songs being written not to be in the charts, it’s nice hearing it on the radio, and on the TV, but there’s nothing like hearing everyone singing it back, and being there yourself while they do it. It’s the same for being a fan of a band, there’s no better night out that you can pay your money for - you go watch something, your favourite band with your best mates, hear your favourite tunes off your favourite album, and see your heroes. We were saying the other day, we played a gig in Sheffield, and me and Benji were stood in that spot watching a band four years before. We were saying, ‘If we weren’t playing here tonight, we’d be here now watching one of our favourite bands anyway.’ So it’s nice to turn up to these places to play, ‘cuz we’d be in the crowd anyway. CDM: Bondy, you said in an interview last week that you feel bad for the front rows of girls at shows who’ve lined up for hours (maybe overnight) - when guys push their way through when the show starts - which is really great that you’re aware of, because it’s something that is quite common for young women at lots of concerts nowadays. Do you feel a sense of responsibility to ensure that everyone attending your concerts feels like they are in a safe space? BONDY: Yeah, of course we do. You want to make sure everyone’s alright, nobody wants to have any horrific event at their own gig. You just hope that everybody has the common decency to help out if anyone falls down. 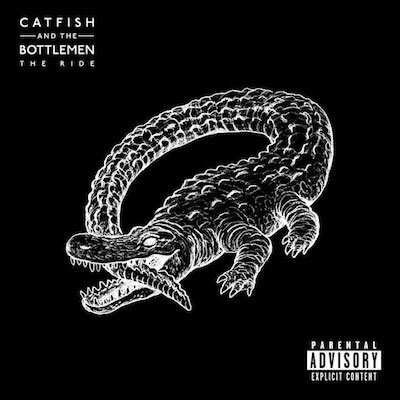 Catfish And The Bottlemen’s album ‘The Ride’ is out now - click here to purchase. MusicEwan McGregor stars in Catfish And The Bottlemen's music video for 'Hourglass'. MusicWatch: Catfish And The Bottlemen perform 'Business', 'Cocoon', and '7' for Vevo Presents. MusicWatch: Catfish And The Bottlemen perform 'Anything' live at T In The Park.